Probend bars with bumpers, enduro shields, powergrip bar ends & hardware (Mount Clamps Not Included). CNC machined 6061 billet aluminum probend bars. Large area to accomodate hands and levers. High quality injection molded enduro style handshields. Integrated composite bumper to protect probend bars. Powergrip Alloy bar ends Includes fittings for standard and oversize bars. Overall my favorite handguards. Great fit, great quality, and great look! Definitely worth the price in my opinion! These Cycra hand guards are The Bench Mark. These are what I always get for my bikes and worth the money for the protection. I've been using Probends for a while and I like them a lot. The newer end plastic cover is a nice touch, but on mine it seems like it didn't fit quite right. Also the self tapping screws didn't work very well and the heads wanted to strip even though I was being careful with my impact driver. I like the fact that you can buy this kit without the inner mounts. I would like it even better if it didn't come with the bar inserts because I didn't use them. Now that these are on my bike they're fine i suppose. However getting them fitted was a nightmare, multiple holes were miss aligned, multiple holes were not even tapped. The pro bends are nice as they give you just a bit of room to get your hand out over the bend to keep it from getting stuck. I've had two sets and they have saved endless levers and occasionally my knuckles swiping a tree. They are going to add maybe 3/8" width on each end of your bars, I know some guys cut their bars down because of the xtra width. Nice too you can buy replacement plastic sepeaate. Helpful hints - tighten but don't wrench them down, in a hard crash it's ok if they give a little and rotate. Not much keep them snug but don't tighten them so they'll never move. Also, I have bent these (that's why 2 sets) . If you try to bend these back cold good chance you will break the aluminum, they are too brittle to bend back cold. To bend back to a usable shape, remove all plastic and take them off your bike. Heat them with a torch (preferably something like a weed burning torch,(an acetylene torch will work if you know what you're doing otherwise you'll melt them) then using channel locks, pliers or what ever you prefer bend them back. Cheers, Go Ride! 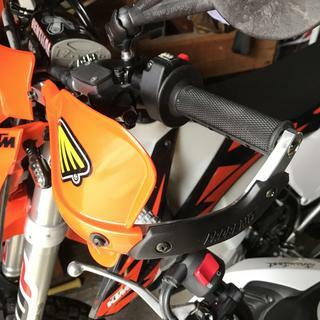 Ordered these hand guards with the Cycera orange clamps and could not be happier with install and quality of the products. I put these on my DR with alloy KTM bars. They fit perfectly with no weird bending or messing around. I had some mounts laying around, so this kit saved me a good chunk off the full kit price. When it got cold out the other day I even noticed that they kept my hands protected from the wind. Great guards and I like the looks of them too. I've always ran the probends and almost bought a different brand for my new bike, but just couldn't do it. 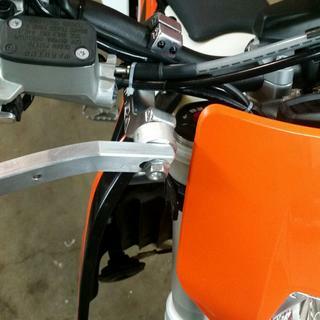 Does not fit 2018 KTM EXC-F 500!!! If you buy these you are going to have to cut about a inch of the end and drill a new mounting hole or they will hit your headlight. Didn't expect this from Cycra!! After I cut it down to fit. Fit great, very sturdy and take a beating very well. I don't often post reviews but wanted to take the time on this one. First, unlike just about every other set of wrap around hand guards RM sells, THESE DO NOT COME WITH CLAMPS. It says it in one spot as a side note and is very easy to miss. So, while they seem like a good deal, you end up having to spend another $40 on top of it. I got these because they seemed sturdy and a good deal (I'm not racing so don't need to spend the 100+ on racing guards). However, once you get them and the clamps you are pretty much in that range anyways. Might as well spend the additional $10 for the better set. Also, the bar-end-bolts did not completely seat in the aluminum wrap around bar. They are supposed to seat flush but would not go all the way in. I tried every combination and nothing worked, googled it, even called RM to make sure I wasn't doing something wrong. I check around and so far I think mine are the only ones I have found with that issue. Not sure what happened but doesn't seem common. Anyway, disappointed from the start, then after the part fitment issue, sent them back. Switched from Enduro Engineering to these because I prefer Cycra's method of attaching the guard to the handlebar and bar mount. The handlebar-end fastener seems to hold on better and is easier to get started, and the end that attaches to the handlebar clamp has a slotted bolt hole so they still fit if you cut your bars down a little. They do, however, attach the plastic roost deflector with annoying (supposedly) self-tapping screws. Anyway, they look good and they protect your hands and levers. Fit good on my OEM Yamaha Pro Taper bars. I had to get the C style clamps. Simple design, tough as nails. Easy install. One thing to note, if you're using the ODI Lock-On grips: Don't saw off the end of the grip. Simply use a utility knife at the end of the grip and cut the around the ODI logo, leaving the rubber flange. Then use a small punch and tap out the plastic end cap. Clean look. These guards are definitely the biggest handguards you will find.They take a ride to get used to how large they are. I would not recommend you put these on any bike smaller than a 125 or expect to find fitting issues. They hold up well to crashes and blows without moving, bending or coming lose. However, the hardware does rust a little which disappoints me. Easy to install, look good, and work well. Had one set come loose, I recommend using Loctite. I use this setup when I cut down my handle bars for single track riding and use G2 ergonomic mounts. These provide good strong protection and take abuse well. Cycra probends are the best handguards. Look great and good coverage. I never saw the benefit of the crm so always buy the normal probends. Great price. It should come with brackets and the screw holes should be threaded for ease of installation. Been racing XC since 2009 on quad and dirtbike. 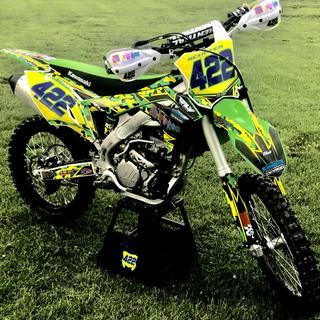 Racing quads on a pro level I would like to believe ive put these handguards to the test. Very impressed with the amount of abuse they can withstand. If your looking for barkbusters you can depend on, look no further. 1. It takes 4 separate tools to install (screwdriver, wrench, 2 different size hex wrenches) 3 different tools if you need to repair/adjust in the field. Simplify the mount hardware to one size hex bolt maybe? 2. Bar inserts did not fit, larger were too large, smaller were way to small. They were also pretty flimsy looking. I used the mounting hardware from my old ACERBIS hand guards to alleviate the use of a box wrench/socket and to have a heavier duty bar insert (just had to grind off the end tabs). I think what you get for the amount of money isn't a great product. I do like the larger shield and gap/drop between on the bar bend. Makes more room for cables/levers/etc. Yes these will help you not buy as many Levers but that is not my concern my concern is that I really enjoy my hands. I seem to use my hands for almost everything I do including typing this review. If you love to smash through brush and trees then I highly recommend the Cycra Probend Handguards. So I love them highly recommend them THEY MAY CHANGE THE WAY YOU RIDE. I have went down on pavement with these and survived just fine. Keep in mind they will scratch bend and get destroyed but your hands and levers will be just fine. 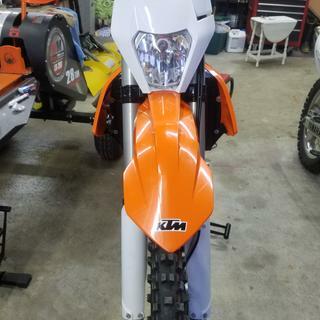 I have the orange and they look just great on my KTM. The other thing that I like about these is the ability to buy parts instead of having to purchase a whole new set up. Not the easiest at least for me, the first time. Best advice I can give is do not tighten anything up until you are completely satisfied with the position they are in. If you do this then the install will go smoothly at best. I have these on all of my bikes, they are tuff and look awesome too. I've had these handguards on my WR450F for a few years now. They have stood up to all kinds of abuse and have not bent. I am very pleased with these guards. I was disappointed when I received them and found that the bar clamps were left out. If it wasn't such a hassle I would return them and buy a complete set of tusk for the same money. I feel ripped off. Love them! Pre drilled holes for the plastic guards during not fit very well, but the bark busters, bend and functionality are great! I use them with the BRP mounts and would not have it any other way. Would work great, I am sure, if they came with the clamp to mount to the handlebars. Not too excited about spending more on the clamps!! Been using these for years and they hold up well and are a good value. These are by far the strongest hand guards I have ever used. I had the hardest crash in a couple of decades right after I put them on. The plastic was a little roughed up, but everything was straight. I'm very impressed. Bought these for my 2017 KTM 350 EXCF. Had to relocate the key to make them fit. This is probably my 4th set of Cycra's, and they are probably still the best out there. This is the first set that I had a problem fitting the handlebar end bolt through the hole in the bar. Not a big deal, I own a drill to make it fit. The other minor problem I had was fitting the plastic hand and bar end guards onto the aluminum hand-guard. The holes didnt line up very well at all and took a little more modifying. Hopefully Cycra isn't letting quality slip because I really like the design of the guards. Overall, good guards though. These things are beefy, especially when coupled with the triple clamp mounts. I think my handlebars will break before these do! They are universal fit though, so if you're used to accessories that are specifically made for your bike, these do not provide that same polished fit that an accessory for a BMW would be like, but the strength and support of these more than make up for that. 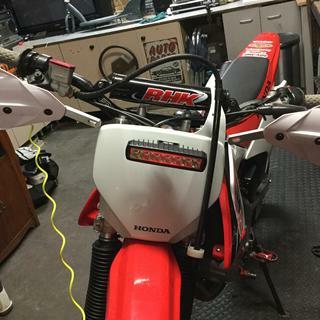 I have these guards for my KFX 450 and Z400 (both with Renthal fatbars) and they fit great and are almost impossible to move when installed correctly. I would recommend these and will purchase them again. Have run several different sets on many machines, have always been happy with the performance. Took a long time to get set in a position that didn't catch my levers and had to set up very high to not interfere with brake line. Every time they take a hard crash they get tweaked and I have to pull em off and straighten out again so not very strong and a pain to install. This is a must have for the woods. These have saved my hand multiple times. Even when i flipped my bike down a hill they held up and didnt break. Absolutely love them. Overall one of the best bark busters and hand guards I've used. 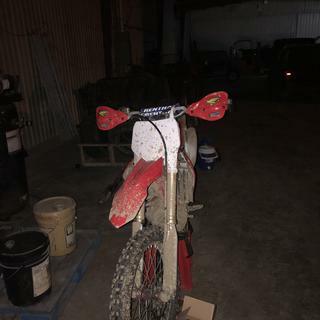 I tried putting the Cycra Probend Alloy Bar Pack Handguards Black on my '16 yz450f, seemed the handbars were too high of a bend, the bolts wouldn't line up at all with the bar mounts...I have the BRP handlebar/guard mounts. 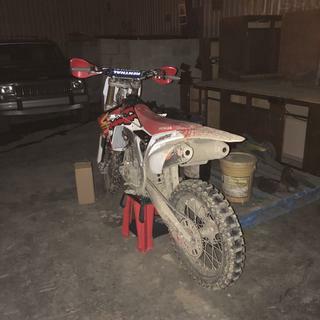 Is there a different bend for higher bars (the stock yz bars)? So if I get these and the Triple Clamp mounts, do I need anything else? BEST ANSWER: It depends on the bike your riding. The triple clamp mounts don't work on my KTM. Also do yourself a favor and throw out the Phillips self tapping screws and buy some Allen head button screws the tap the mounting holes with the appropriate tap. You should be all set. 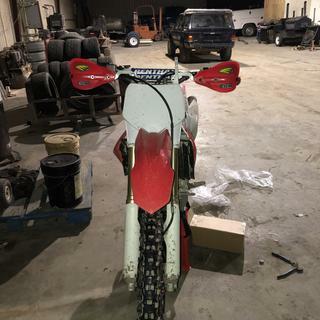 You will need to cut the ends of the grips and this may be a good time to put new grips on because once you install these you have have to remove the handguards in order to install grips. I am not familiar with the triple clamp mount. The ones I have on my KTM only mount to the bars. They hold up really well hitting trees and during a crash. These are the best I've used. I believe you will need longer bolts for the triple clamps. The bolts will need to be as much longer as the mounts are thick. I got some nice stainless bolts with Allen heads. You need extended hardware with the triple clamp mounts because your stock triple clamp bolts will be too short on length. yes longer bolts for the triple clamps mounts. Not sure if they come with kit. No but you might have to tweak them a little to fit. will they fit a 2014 Ktm 350 xcf ? BEST ANSWER: Yes just double check you order the (right) bar clamps. I run these on my ktm 690R and my buddy has them on his husky 300 2stroke. It is possible to wear it.You need Cycra Handguard U-Clamps Natural 1 1/8 "Renthal Fat Bars / Neken to fit it. These will fit, the sometimes require some bending of the aluminum bar. Will these work with the 7/8" handlebar clamp mounts? BEST ANSWER: yes they should work with them, as long as the size of your handlebar is the same size as the clamp, should be no problem. It looks like those will work for the standard size bars. Great setup! That's what I use with 1 1/8 bar. Yes. There is an insert for the 7/8" bars. What clamps did the 2017+ KTM EXCF owners use? BEST ANSWER: That bike will have 1 1/18" handlebars so you will need to select that size of clamp to fit those bars. Part number 1218830008. Use the BRP hanguard mounts.. Fits on a 450x 2012? Yes they will. You have to order the inner bar mounts according to the bars you have. Twin Wall has straight 1 1/8 mounts, Pro Tapers have tapered 1 1/8 mounts. BEST ANSWER: I have this setup on my DRZ and they work great, but my clamps bolt from the side. If yours bolt from the front you'll need the Cycra Pro Bend Front Triple Clamp Mounts. If the pinch bolts face forward on your triple clamps, this will not fit. Will these fit and 08 yz250f? BEST ANSWER: Nope, you will need the full kit for a 1 1/8" bar, These do not have a mount for the center of the bar, only the bar end mounts. This kit would be perfect if you already had bar clamps though. Yes, just make sure you get the right size for your handlebars. Can I use these on my Flexx bars with the BRP adapters? BEST ANSWER: I would get the Cycra guards made for the Flexx bars. They fit much better. I have the BRP adapters already, and the reviews of the HG's made for Fasst Flexx said they had to buy / replace bolts and spacers with better quality stuff? So I don't see the need to spend more $$ if I already have the adapters? Yes, that is the setup I have. Will they fit on a Honda 300ex? BEST ANSWER: I don't know. I bought them for a CRF450X & CRF230F. Both bikes have Renthal 7/8 bars & the fit with no problem. What year is your 230? I'm picking up a 2016 tomorrow. Wondering which clamps to buy. They come with 2 different sizes ends, They should fit! 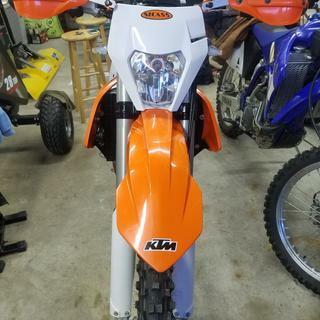 Will this fit my '18 KTM 690R Enduro? 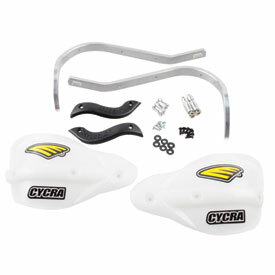 What is the difference between these handgaurds and the Cycra Probend CRM racer pack? 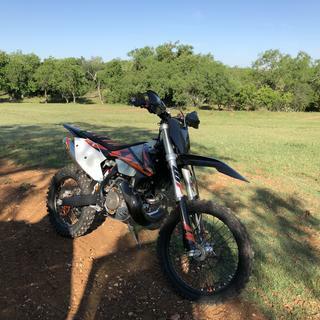 I have a KTM 250xc which I believe has 1-1/8" bars. BEST ANSWER: From what I could see when I was buying this, it does not have the mount for the handle bars, just the aluminum bar, deflector and the end mount that goes into the end of your handlebar. That was a good thing for me because I wanted the the triple clamp mount. That mount worked great although you will have to source some longer bolts for your triple clamps. Will these for a KTM EXC F 500? BEST ANSWER: They should fit, they fit my 450 EXC just fine. The bars get pretty full with the extra EXC switches for blinkers & horn but they fit on my bike even with shortened bars. Will these work with Renthal 1-1/8 Fatbars? The bars are tapered in the area where the hardguard would mount. BEST ANSWER: Yes, these will fit if you purchase the 1 1/8" clamps. I've attached a link below. On the Cycra probend bar pack, what's the difference between natural and white? BEST ANSWER: The Natural White is kind of a clear white or semi-transparent white (almost like the fuel tanks on some bikes), where as the White is a solid white.